Fly fishing in Texas varies, from casting foam spiders at the local pond for perch, drifting small midges and nymphs for trout on the Guadalupe River, to casting quite large flies for bass, and saltwater species. Members of our club have a long-standing tradition of often sharing flies with fellow fly fishers they meet on the water, especially when they've "matched the hatch." Keeping with this, we offer the following information as our gift to you. We're sure that you'll see many familiar patterns, and perhaps a few new ones. 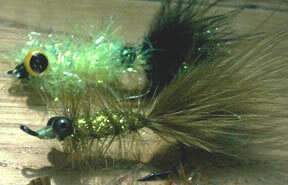 Each month, on the fourth Tuesday, we have an informal evening of fly-tying. A lot of information and knowledge is shared these nights, not to mention quite a bit of laughter. As you can see from the picture on the right, some fly-tying does take place between laughs. In 2007 we tied sets of flies for Casting For Recovery's Texas Retreat. We hope to make this a long-standing part of our community outreach.